Revolvers are great weapons for self-defense because they don’t require any pushing or pulling of levers to fire. They are simple, easy guns to use. Revolvers will also shoot more rounds without problem than other guns. Your handy, efficient revolver should have a high quality holster for safe carry. There are many different ways to carry a gun, such as on your hip, leg, ankle, shoulder, and in your pocket. Regardless of which carry you prefer, a comfortable, secure holster is essential for your safety. Consider one of the following top revolver holsters on the market for safely and comfortably carrying your weapon. 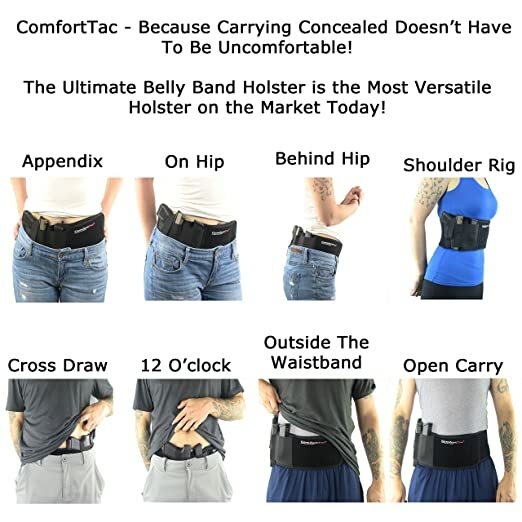 One of the best revolver holsters for concealed carry is the ComfortTac Ultimate Belly Band. It’s a versatile holster, offering eight different styles of carry, including cross draw, on hip, behind hip, and shoulder rig. A belt isn’t needed for using this concealed carry holster. It works with loose fitting jeans, sweat pants, yoga pants, and gym shorts. The holster stays secure and comfortable while you work out, run, or ride a bicycle. It’s made of neoprene fabric, allowing the band to stretch up to 44″ in diameter for a comfortable fit. Neoprene fabric assists in concealing the weapon as well. The belly band holster is comfortable enough to wear against your skin. This gun holster comes with a spare magazine pocket for carrying extra ammunition too. It’s available in both left hand and right hand orientation. Not many revolver holsters come with a lifetime warranty like The Ultimate Suede Leather IWB Holster does. You’ll have greater peace of mind when buying it. 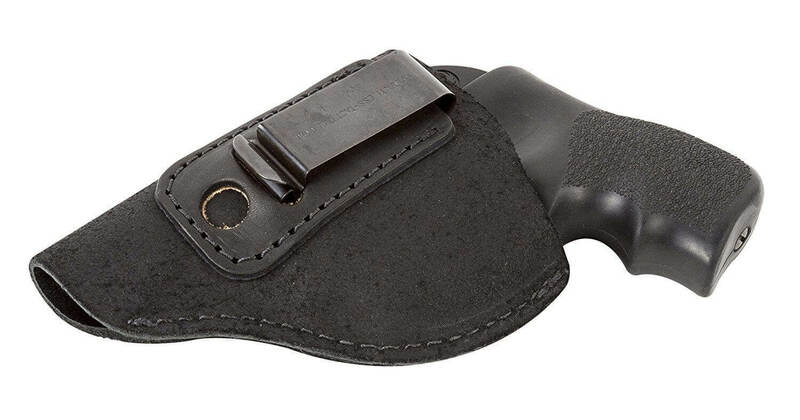 This American-made gun holster fits most J Frame revolvers and 0.38 special type guns. Examples of specific models it fits are the Smith and Wesson Bodyguard, Ruger LCR, Taurus, and Charter. The holsters are handmade from genuine suede leather, resulting in a higher quality product. They fit inside the waistband and are designed for concealed carry. Both a right handed and left handed version are available. The Bobby Macs MPH Pocket Holster is designed for comfortable, concealed carry of your revolver. You can slip it inside your pocket, back pocket, and a jacket pocket depending on the jacket. The holster is made of 6/7 oz leather for a sturdy design. It has a reinforced mouth that keeps the holster open after you draw. Designed with concealment in mind, the pocket holster doesn’t print. The pocket holster can be used either for left hand or right hand draw. To convert it into a left hand draw, you must unscrew the leather shield, flip it around, and rescrew it. 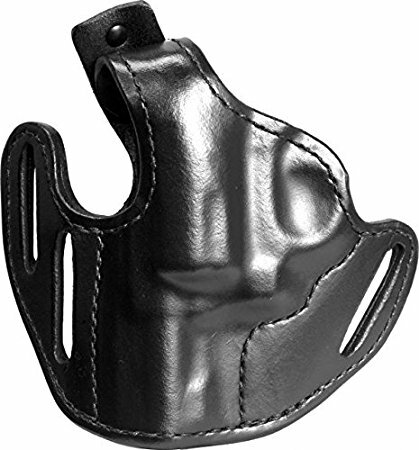 You can order the pocket holster with a rubber coating, tack back, or standard leather shield. The tack back and rubber grip help the holster stay inside your pocket during draw. A tack back or rubber coating is $5 extra. One of the best revolver holsters you’ll find for under $20 is the Outbags Nylon OWB Belt Gun Holster. It features a fully adjustable thumb break that minimizes delay while drawing your gun. The thumb break aids in keeping your revolver more secure as well. This gun holster comes with a removable steel belt clip that enables mounting to your belt or waistband. It also has a magazine pouch for storing ammunition. 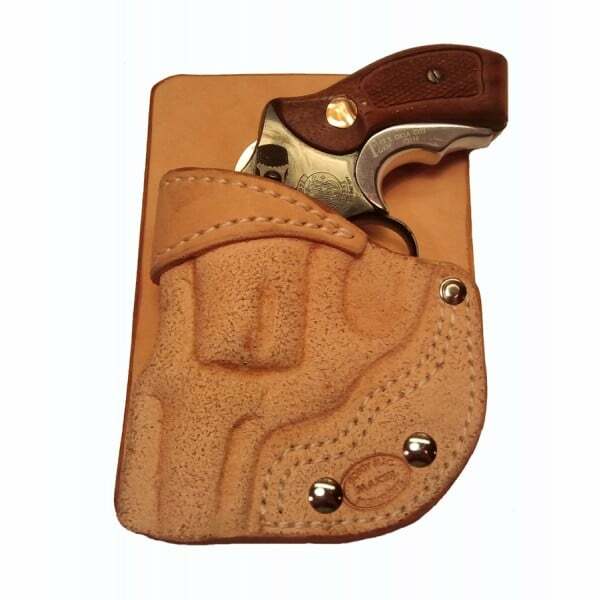 The holster fits most 4″ 6-shot revolvers from Smith & Wesson, Colt, Taurus, Ruger, and Rossi. It is available in both right and left hand versions. The Gould & Goodrich Leather Three-Slot Pancake Holster is made of premium top grain leather in the USA. It can be worn either tilted or straight up. The rear sight area is low cut, allowing for an easier draw. Most small-frame double-action revolvers fit inside this Gould & Goodrich pancake holster. Examples of gun models it can hold include COLT Agent, DSII, Cobra, SFVI, and TAURUS 85. It can also be used either on your strong side or as a cross draw. The five revolver holsters listed above are excellent options for carrying your weapon with you. 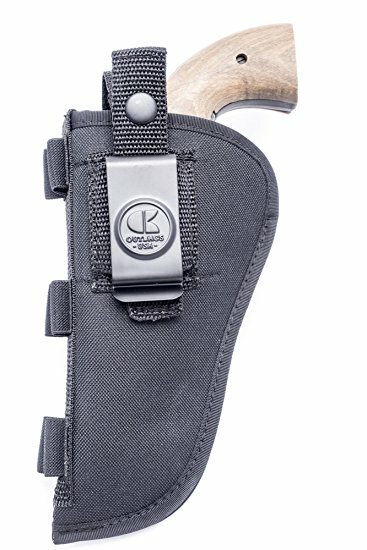 If you have a concealed carry permit, the ComfortTac Ultimate Belly Band Holster, Ultimate Suede Leather IWB Holster, and Bobby Macs MPH Pocket Holster are good options. Those who aren’t allowed to conceal carry should ensure they use the holster in a noticeable way. 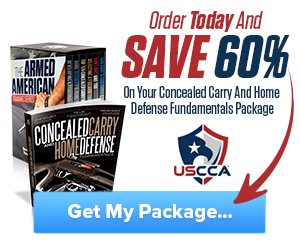 The last two holsters on this list are good choices for those without a concealed carry permit. Which of these revolver holsters do you like the most? Have you ever used a revolver holster before? Let us know in the comments below. Hey Buddy!, I found this information for you: "Top 5 Revolver Holsters on the Market". 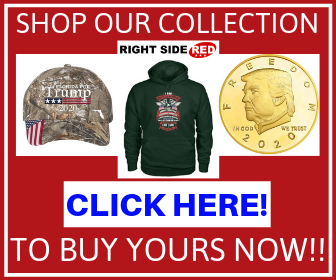 Here is the website link: https://thegunrights.com/revolver-holsters/. Thank you.